19 Apr 2018 --- PB Gelatins/PB Leiner is marketing innovative solugel collagen products, that they say, make it even easier for their customers to grasp the opportunity collagen can bring to their health. The collagen industry is active and its growth is exemplified by Innova Market Insights figures, which show that there was a +34 percent compound annual growth rate (CAGR) in new product launches for collagen peptides from 2010 to 2016. Collagen has enjoyed recognition as a leading health ingredient that claims to support healthy aging, protein intake, beauty and medical nutrition, as well as sports nutrition. As a global player in the scene, PB Gelatins/PB Leiner provide a complete range of collagen peptides under the solugel brand name. 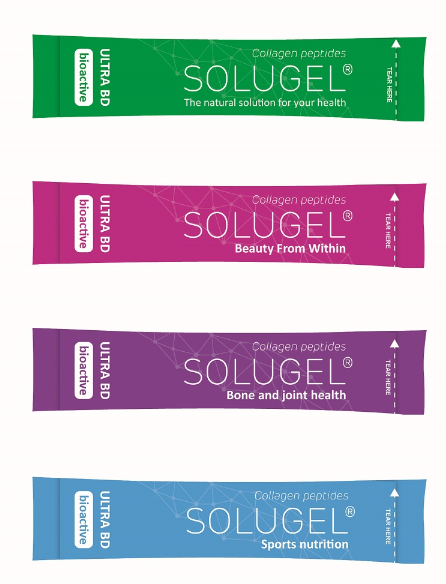 The solugel BD series consists of a variety of agglomerated collagen peptides with characteristics that reduce the risks of dust and lump formation when dissolving. This, they state, makes them an ideal ingredient for applications in which instant solubility is a crucial factor. In addition, solugel Ultra B, a fine powder collagen product with organoleptic properties, is also produced. Such powder collagens are used for the creation of homogenous blends where the majority of the powder is fine. With a protein content of over 91 percent, collagens are a potential candidate for boosting the volume of protein in food applications. Furthermore, they can tout being natural products from a single source, are be based on raw materials - including halal and kosher products - and are free from any preservatives, artificial colors, flavors, gluten, sweeteners or any other additives. A collagen whey protein shake, which utilizes collagen as a key component of joints, cartilages, ligaments and tendons. The shake contains solugel Ultra B collagen and whey protein, and hopes to prevent injuries and speed up recovery times after sporting. The solugel stick packs claim to be neutral in taste, and quickly dissolvable in any liquid. Collagen is the most abundant protein in the human body, and it accounts for over 30 percent of the body’s protein and critical building blocks that provide support and structure to the body. Several clinical studies have proven the health benefits of collagen peptides. Collagen is often touted as providing beauty from within, as it can be ingested orally, and it is enjoying worldwide growth and application. PB Gelatins/PB Leiner will present their array of collagen product concepts at Vitafoods 2018, in Geneva this May, at booth A34.